Posted on Mon, Feb 27, 2012 : 1:53 p.m. Joining two of his downtown Ann Arbor business ventures — Downtown Home & Garden and Mark’s Carts outdoor food courtyard — owner Mark Hodesh has a new concept for South Ashley Street: Bill’s Beer Garden. Hodesh and a long-time business associate, Bill Zolkowski, submitted a site plan to the city of Ann Arbor to open the outdoor beer and wine garden on a portion of the Downtown Home & Garden parking lot this summer. The plan: construct a 422-square-foot storage and restroom building, two open-air pavilions with seating, and an enclosed pavilion for the bar on a portion of the existing parking lot, located at the northwest corner of Liberty and Ashley. There will be a corridor connecting Bill’s Beer Garden with Mark’s Carts, and customers will be able to bring food from the courtyard to the beer garden. The garden, which will serve Michigan craft beer and wine and host live music and other entertainment events, will be open from 5 p.m. to 11 p.m. while the weather is warm. Hodesh and Zolkowski hope to begin construction the first week of March and open it by mid-summer. The relationship between Hodesh and Zolkowski dates back nearly 40 years, when Zolkowski was a cook at Hodesh’s newly opened Fleetwood Diner on South Ashley Street in 1975. Zolkowski then opened the import shop Baobob in downtown Ann Arbor, and most recently was the principal of the three high schools in the Plymouth-Canton system. “Who could ask for a better retirement plan than to operate a beer garden in the heart of downtown Ann Arbor?” Zolkowski said in a statement. Hodesh told AnnArbor.com his plan for the garden is to make it a “community gathering spot,” where people can socialize and hang out - something he saw firsthand at a beer garden in Brooklyn, NY. Hodesh and Zolkowski want to open Bill's Beer Garden by mid-summer on a portion of Downtown Home & Garden's parking lot. Hodesh also nodded to downtown Ann Arbor’s “ever changing retail environment,” and a shift away from retail and towards entertainment. Bill’s Beer Garden, he said, fits the changing environment. It gives him "double use" of his parking lot, where people can still park during the day and then it transforms to the beer garden at night. 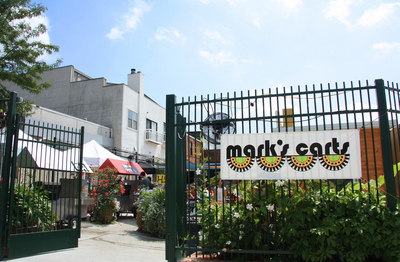 Hodesh called the relationship between Mark’s Carts and Bill’s Beer Garden “hand in glove,” where people spending time at the garden can also eat at the courtyard - which plans to open for its second season March 30. Thu, Mar 1, 2012 : 4:33 p.m. This idea sounds great. Having only been to Paris once, I loved the numerous cafes tucked away on every back street where one could sit down and have a beer, wine, coffee and snack. This will further make our fair city &quot;cool&quot;. Tue, Feb 28, 2012 : 11:44 a.m. Excellent. I've not been to Marks Food Court as yet, but it is on my bucket list for this summer. Best wishes to all for this very unique area of Ann Arbor. Tue, Feb 28, 2012 : 2:30 a.m. This is very exciting! I would be great if in addition to having Michigan craft beer - if the wine was also from one or more of the many, and great, local Michigan wineries! Tue, Feb 28, 2012 : 2 a.m.
Tue, Feb 28, 2012 : 12:42 a.m.
What is this Mark's Carts place? Don't think I have ever seen any stories about it yet on annarbor.com. Beer garden in Ann Arbor is an awesome idea! They can put Hamms in a bottle, put a made in Michigan label on it, triple the price, and all of the craft beer slappies will say it is the best beer ever! Tue, Feb 28, 2012 : 2:46 a.m.
Tue, Feb 28, 2012 : 12:04 a.m. Downtown Home and Garden = great! Marks Carts = great! A beer garden with Michigan beer? I'm fully on board with this. I like Mark Hodesh's commitment to downtown, and for bringing in different, unique things. Mon, Feb 27, 2012 : 10:39 p.m. This is a great idea! Having been to or seen some of NYC's and Europe's beer gardens I can promise there will be huge crowds, huge noise, huge drinking, more traffic and and major overflow of disappointed, impatient patrons. And that's the good part. It's just what A2 needs to give it that big city boost. Mon, Feb 27, 2012 : 10:12 p.m.
Mon, Feb 27, 2012 : 9:58 p.m.
hopefully Dominics realizes how annoying it has become to drink there. Yep! Mon, Feb 27, 2012 : 9:55 p.m.
Mon, Feb 27, 2012 : 9:50 p.m. YES YES YES! I have often thought if I could open a business and money were no object, it would be my dream to open a beer garden in this exact part of town. (I'm thinking something much larger and elaborate that the city would no doubt fight over then poo-poo after 2 years of back-and-forthing me to death.) I look forward to stopping by there after work when it's open. Good luck, guys! And I agree with those commenting on Dominicks... not to mention, $23 for a half-gallon of Oberon is obscene. I've stopped going there. Mon, Feb 27, 2012 : 9:43 p.m.
Mon, Feb 27, 2012 : 9:39 p.m. This is awesome. The 3 picnics per year at German Park are not enough! Mon, Feb 27, 2012 : 9:06 p.m. This is nice news. No doubt. This bear loves beer, GRRR. However, as other readers point out, there have been so many articles relating to Mark's Carts. Over the past few months, I have read numerous articles about businesses closing--and I never even knew they were open, because they never got coverage. Yes, Mark's Carts is very interesting and worthy of news. I just wish I could hear about some other businesses in the area and what they are up to. Especially the little ones that don't get much, or any, media coverage, but are still doing innovative and exciting things in Ann Arbor and the area. Why not have a daily story about a retail business in Ann Arbor, Dexter, Chelsea, Saline, etc. in the top list of stories the way Mark's Carts is highlighted? Mon, Feb 27, 2012 : 9:44 p.m.
Mon, Feb 27, 2012 : 9:05 p.m. Sounds like Gowanus Yacht Club in Brooklyn. But more uptight. Mon, Feb 27, 2012 : 8:54 p.m.
And for the next story in the continuing saga of Mark's Carts (and related entities), please let us know which beers and wines will be featured. Mon, Feb 27, 2012 : 8:44 p.m. I like a the beer, it makes me a jolly good fellow! And another good thing is that it is outdoors, so smoking stogies and having a beer should be acceptable! I vote yes! Ah, but you haven't heard? Mark's Carts will be opening a cigar bar also! Mon, Feb 27, 2012 : 9 p.m.
No, you still can't smoke if they are serving beer. Mon, Feb 27, 2012 : 8:28 p.m.
Love the concept! I will definitely be there with friends when it opens! Who will be supplying the beer? Local breweries? Love the idea of a beer/wine garden downtown. I hope they think about a relaxing atmosphere because it is not just students in Ann Arbor who enjoy coming downtown for different venues. Mon, Feb 27, 2012 : 7:46 p.m.
Mon, Feb 27, 2012 : 8:26 p.m. This is good news....the Dominic's &quot;RESERVED TABLE&quot; has become the norm, the beer garden aspect is ruined by all the tables being reserved by groups...so I'm glad we get some alternatives, hopefully Dominics realizes how annoying it has become to drink there. Mon, Feb 27, 2012 : 7:11 p.m.
What a good idea! Hope the City doesn't throw too many obstacles in its path. Mon, Feb 27, 2012 : 9:18 p.m. I happened to attend the HDC meeting where approval was given for the beer garden outbuildings, and to my untrained eye it seemed like the commissioners couldn't vote &quot;yes&quot; fast enough. And why not of course! As a beer lover I think it's a great idea, and Mr. Hodesh seems to be brilliantly maximizing his use of the property. Count me as excited. Mon, Feb 27, 2012 : 7:02 p.m.
Would be nice alternative to Dominick's. Particularly now that when you go to Dominick's all the good table are reserved and it's nearly impossible to find a place to sit.